New 25 Gal spot sprayer comes with 25 Gal poly tank, 2.8 GPM pump and handwand spray nozzle with 6 feet of hose. The Super-Spot sprayers don't come with all the bells and whistles - they just do the job. Plus, they won't raid your wallet and wreck your budget. Ideal for around the farm, home or hunting lease. 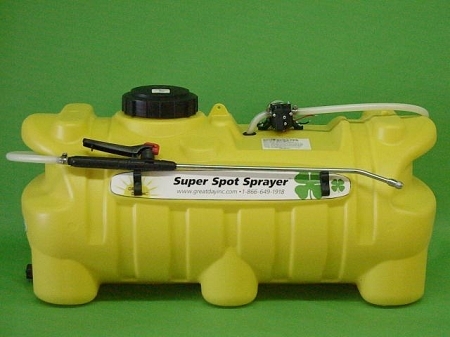 Super-Spot sprayers are available in 15, 25 and 50 gallon models. All sprayers are designed to conveniently strap to ATV rear racks or UTV beds without need of hardware or wrenches. Tanks are corrosion-proof polyethylene and come equipped with a 12-volt 60 PSI pump. A handwand spray nozzle with 6 feet of hose, splash-proof vented lid, a toggle cut-off switch, large 15" fill well and a drain valve come standard on all models. The SuperSpot handwand can be set to deliver a fine mist for delicate, controlled applications or adjusted to reach out to 25 ft.